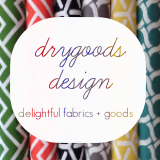 We're entering our last week of Christmas in July and it's time to focus on FABRIC! Christmas and seasonal fabrics are starting to pop up all over the web and in our favorite shops. Here is a selection of a few super cute holiday collections, plus some useful links for your Christmas fabric shopping. I love the adorable illustrations (birdies! cloth line!) and the simple coordinates that could be used in a variety of projects. 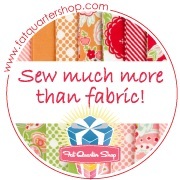 You can purchase this collection at Fat Quarter Shop and Alewives Fabrics. Kate Spain never fails to please the eye with bold, colorful and modern designs. This little Christmas collection is as joyful as can be! You can purchase these prints at The Intrepid Thread and Fat Quarter Shop. Alpine Wonderland reminds me of vintage story books and old-timey Christmas cards. The designs are so sweet and old-fashioned without feeling dated. I have found this collection for sale at Fat Quarter Shop and Hawthorne Threads. Deer, mittens, Christmas trees and argyle... Cuteness! I love the greys and aquas. I found Tinsel at Hawhtorne Threads and Fat Quarter Shop. I love how unique this collection is! 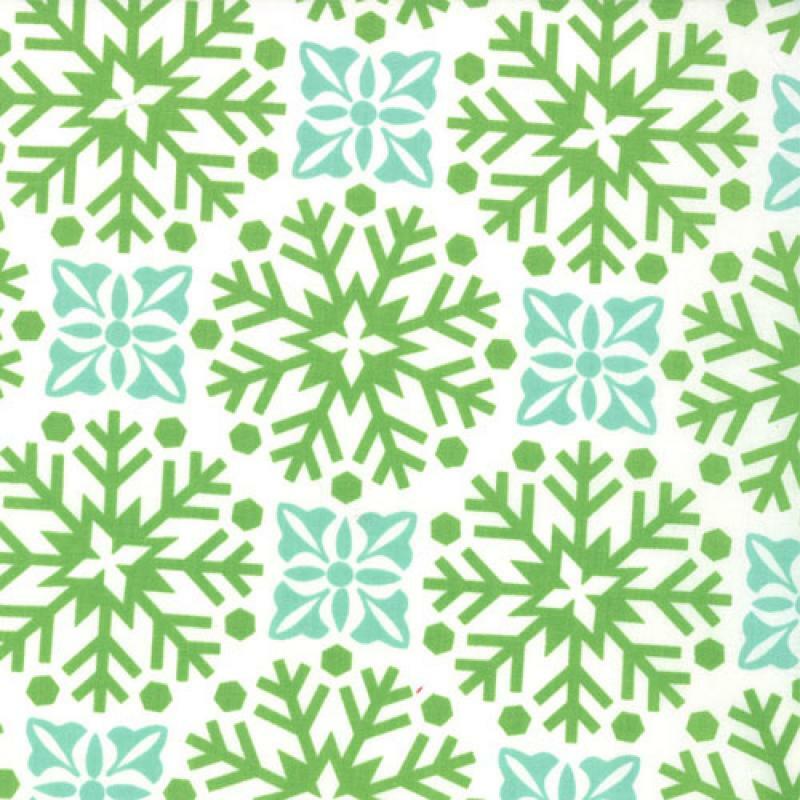 From the furry polar bears to the Scandinavian-influenced flower designs and lacy snowflakes, these fabrics would make some really original holiday projects. Some prints from this collection are available from Hawthorne Threads. 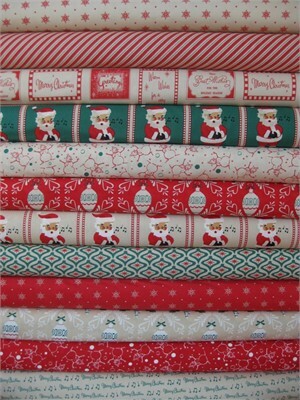 Last but not least in this Christmas fabric round-up is the wonderfully retro collection Dear Mr. Claus. The prints looks like wrapping paper from our childhood. Remember those Christmas mornings oh so long ago? This collection is available at Fat Quarter Shop (stay tuned for a giveaway right here this week!!) and Fabricworm. I know, I said I was done. But I can't stop before I share this great idea that Keli at Drygoods Design told me: Dear Stella's metallic fabrics would make perfect holiday linens! Wouldn't the navy and gold make a lovely New Year's Eve table runner or fancy cocktail napkins? 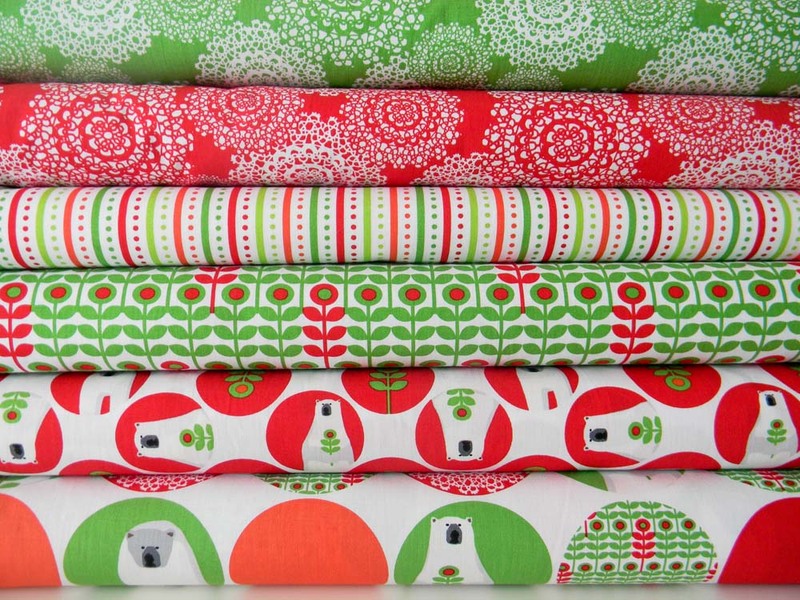 - We gave away one Ardeth's Christmas Bundle, but Alewives Fabrics has more for sale. Love the color combo and assortment of fabrics! Alewives Fabrics also has a nice selection of holiday fabrics here. 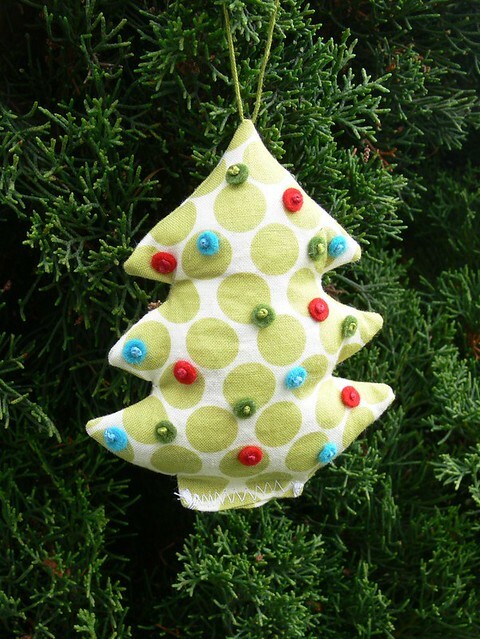 - You can find seasonal and Christmas fabrics at Hawthorne Threads. - The Intrepid Thread also has a lovely holiday category in their shop. - Fabricworm has some GREAT holiday and seasonal fabrics in stock, including several of the above featured collections. Do you have a favorite Christmas or winter collection not featured here? Did we forget a fabric shop with a fabulous seasonal inventory? Please share in the comments! Hello everyone! I hope you've had a great week. Not sure how my oldest starts school in exactly ONE WEEK, but there you go. This summer has flown by! I have an exciting Christmas in July giveaway to announce: our brand new sponsor Felt on the Fly is giving away one of their fabulous holiday color stories to one lucky winner! 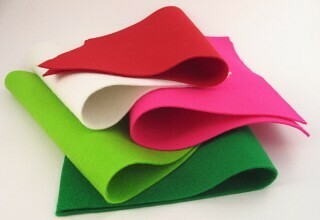 That is 5 sheets of luxurious wool felt in a beautiful combination of colors. The winner can choose between Holiday Brights (left) and Blossom (right). Each set includes 5 sheets of 8 by 10 inch, 100% merino wool felt, 1mm thick (1/16"). 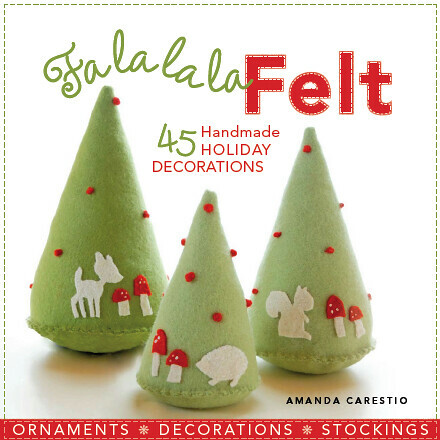 This lucky winner will also receive a copy of the wonderful holiday book Fa La La La Felt by Amanda Carestio, courtesy of Lark Crafts! This book is a favorite around Stumbles & Stitches, and full of perfect projects to craft with the beautiful wool felt from Felt on the Fly. For a chance to win, simply leave a comment on this post! If you'd like, tell us which Felt on the Fly color story you would pick and what you'd make with it. Please make sure to include a link or email address in your comment so we can contact you if you win. This giveaway is open until Sunday, July 29 at midnight CST. Giveaway is open to all our readers! This giveaway is now closed. Thank you to everyone who participated! Congratulations to our lucky winner JoyceLM, check your email! 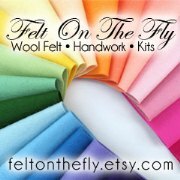 You can find Felt on the Fly online here: shop / blog / Facebook / Pinterest. 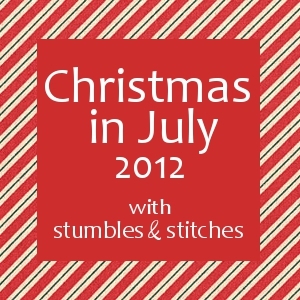 We have much more in store for Christmas in July: tutorials, inspiration and another big giveaway! We hope you'll come visit. I hope everyone is feeling inspired by the Christmas in July posts so far. We've been working on our own Christmas-y projects and can't wait to share. 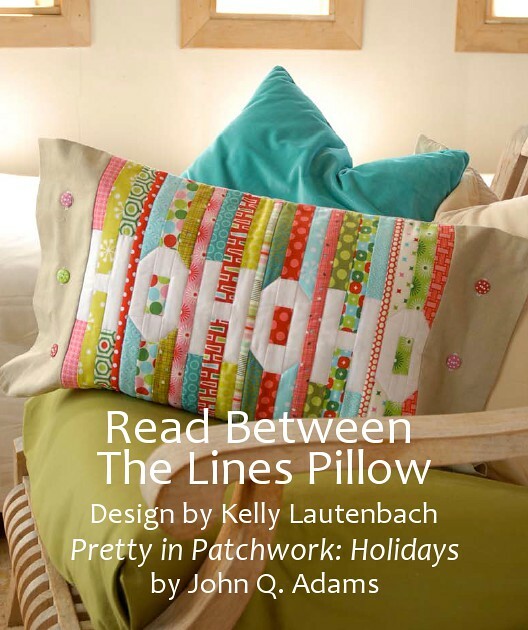 Today we're sharing another lovely project from the upcoming book Pretty in Patchwork: Holidays by John Q. Adams: the Read Between The Lines Pillow designed by Kelly Lautenbach. How clever is that patchworked Ho Ho Ho? Big thanks to Lark Crafts for sharing this project with us! Wouldn't this pillow look great with the fabric from the Ardeth's Christmas fat quarter bundle assembled by Alewives Fabrics? Pretty in Patchwork: Holidays will be released in August! Stay tuned for a chance to win the book right here on Stumbles & Stitches. If you missed our previous free project from this book, you can download the Milk and Cookie Mats pattern PDF here. Stay tuned for more Christmas in July fun this week: project updates, designer features, ornament tutorials, another giveaway and more! Internet issues and a kidnapped camera left me unable to show you photos of the fabrics I chose for the Milk and Cookie mat, but I will say that a little Heather Ross gnome fabric snuck into the mix! I decided to go ahead and try the traditional piecing suggested by the quilt pattern creator John Adams, time to learn something new don't you think? For the weekend, I thought I'd re-share the three amazing projects from the Lark book Fa La La La Felt by Amanda Carestio, from last year's Christmas in July. Perfect in case you need a small piece of handwork to take with you on vacation or to the pool! Below each photo you will find the link to a post featuring the free PDF download for the project. 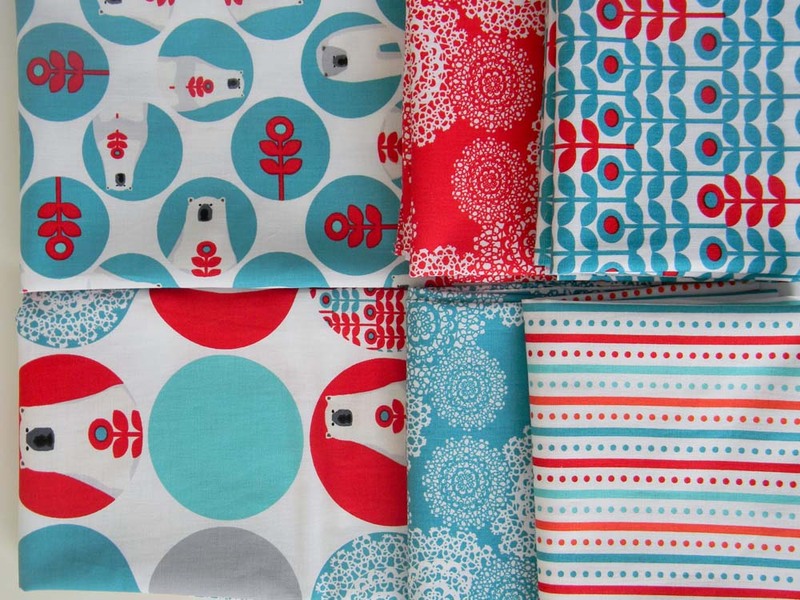 And don't forget our first Christmas in July giveaway: a fat quarter bundle from Alewives Fabric! Go HERE to enter. Have a great weekend! We can't wait to see what you're working on for Christmas in July! 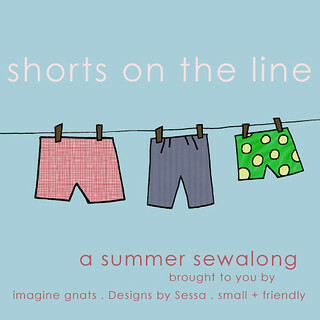 This is a momentary break in our Christmas in July series to let you know I am guest posting on the blog Designs by Sessa today as part of the Shorts on the Line sew-along. 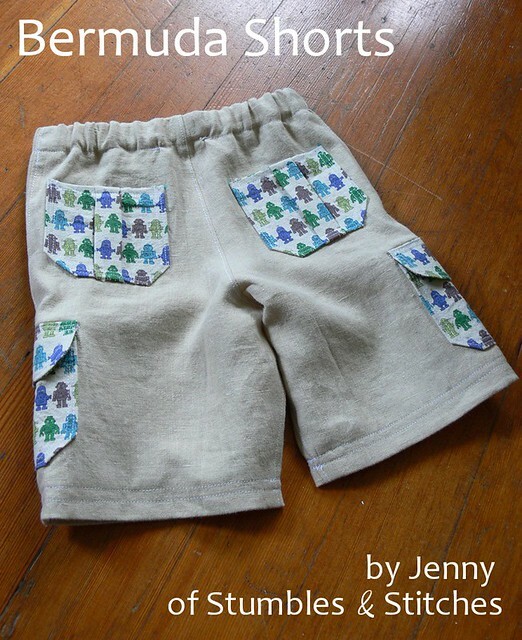 Go check out the cute little shorts I made for Henry and read my pattern review. I am so excited to have made a clothing item, and it is wearable! And adorable! It is the boost I needed to my confidence. I might try to sew more clothing items in the future! Stay tuned... Big thanks to Rachael for inviting me to participate! 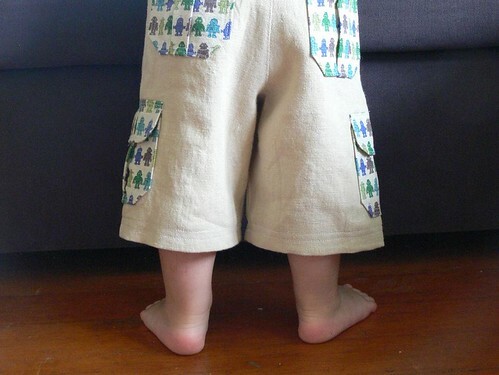 You can see the whole line up for the Shorts on the Line sew-along here. Go see all the fabulous shorts created by all the awesome guest posters! I'm so impressed. You can also visit the Flickr pool to see what the sew-along participants have made. Are you participating? The list of judges and prizes is pretty ah-mazing, wow! Stay tuned for more Christmas in July fun. Next week should be pretty jam packed with tutorials, another free download, inspiration, and more giveaways! 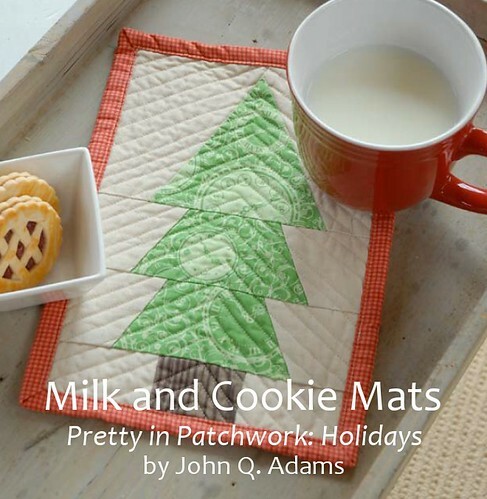 Meanwhile, our first free download from the book Pretty in Patchwork: Holidays is available here, and our first giveaway (a fat quarter bundle from Alewives Fabrics!) is open through Sunday -- you can enter here. In the spirit of Christmas in July, I've been browsing my Christmas board on Pinterest to start planning ahead for the crafts and decorations we'll be making either before or during the Christmas season this year. While scrolling through these lovely photos, I couldn't help but become a bit overwhelmed! How about you? Are you in the Christmas spirit yet? I'd love to find out what you're planning to work on. If you have a Christmas board on Pinterest, please let us know in the comments. Speaking of Pinterest, you can follow me here and Angel here. 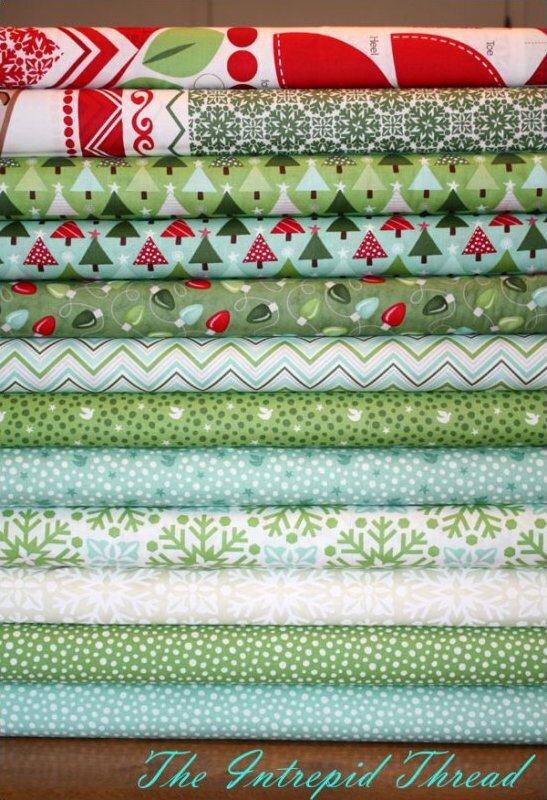 Don't forget to enter our first giveaway for Christmas in July, a beautiful holiday fat quarter bundle from Alewives Fabrics. 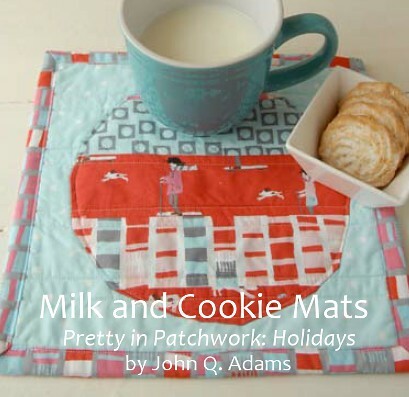 We also shared our first free download from the new book Pretty in Patchwork: Holidays, a cute Milk and Cookies Mat. There's much more coming, so please come back and visit! Hello everyone! Are you ready for our first giveaway for Christmas in July 2012? Alewives Fabrics has done it again. Rhea and her team always come up with gorgeous giveaway bundles. This is the second year in a row that they've offered a custom holiday fat quarter bundle to our readers during Christmas in July! Alewives Fabrics is pleased to be giving away to one lucky Stumbles & Stitches reader one of our brand new "Ardeth's Christmas" fat quarter bundles. Named after my step-grandmother who had THE most spectacular collection of vintage 50's and 60's Christmas ornaments I have ever seen, this bundle of 10 different fat quarters (all in quilting weight cotton) features sweet prints of deer, snowmen, holiday text and more. The colors are delightfully kitschy, yet modern at the same time! Happy tones of red, green, turquoise, ivory and just a touch of brown. Ardeth (also a fabulous quilter) would definitely have approved! This lovely bundle has a retail value of $29.95. Thank you so much to Rhea and Alewives Fabrics for this awesome holiday giveaway! For a chance to win, simply leave a comment on this post! 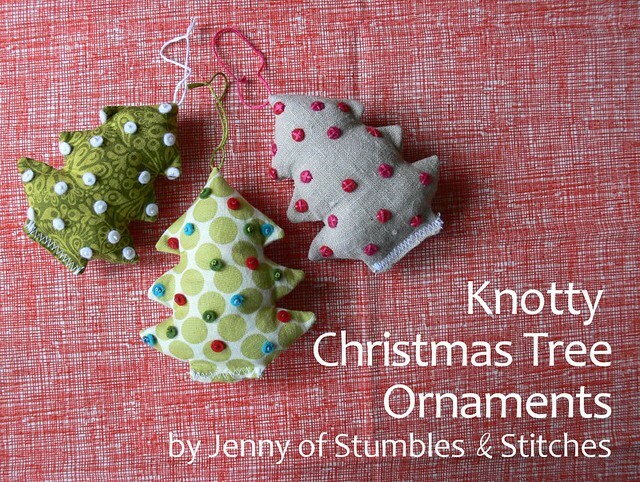 If you'd like, tell us what you would make with Ardeth's Christmas bundle. Please make sure to include a link or email address in your comment so we can contact you if you win. This giveaway is open until Sunday, July 22 at midnight CST. U.S. residents only please, apologies to our international friends! This giveaway is now open to everyone! International entries welcome. You can find Alewives Fabrics online here: shop / blog / Facebook / Twitter. We have much more in store for Christmas in July: free downloads, tutorials, inspiration and giveaways! We hope you'll come visit. See what materials you need, select your fabrics and get started! I'm going to gather my supplies today and do a little WIP/Show and Tell post tomorrow. I'm still deciding whether to "chicken out" and use felt for my first go at this design, I am not a very precise cutter or piecer when it comes to patchwork. Thank you to Lark Crafts and Amanda, our wonderful contact there, for sharing this project with us!